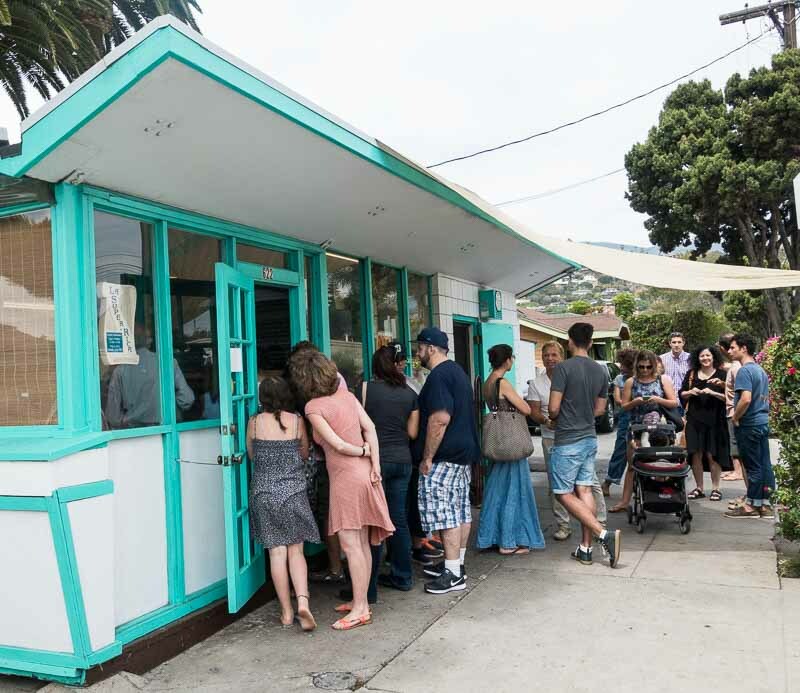 Last night, Jamie Ney commented on my blog post, recommending La Taqueria Super Rico here in Santa Barbara, so that’s where we headed for lunch. The place is as simple as can be, with a window for ordering, a window for pick-up and a few picnic tables. All of the people you see above are in line, and there were more inside waiting to order. Here’s the bald facts: Gail wouldn’t wait in line 30 minutes for the express lane to heaven. She sure as hell won’t wait that long for a taco, no matter how good. Driving along Milpas Street to Super Rico, we passed at least 4 other taqueiras, so we just drove back to one with good parking, which turned out to be Taqueria La Colmena. 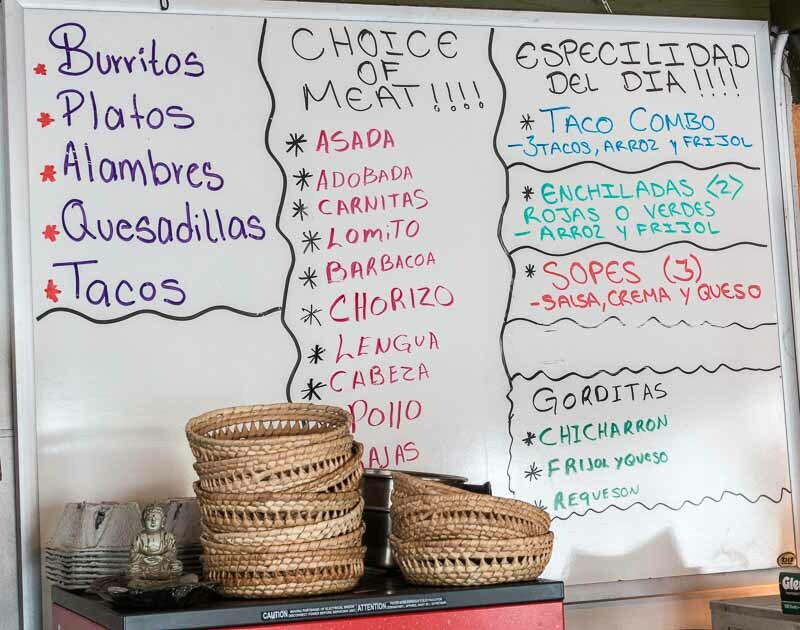 You know you are in an authentic joint when the menu board is all in Spanish. We were the only gringos there, of course. That’s usually a good thing. 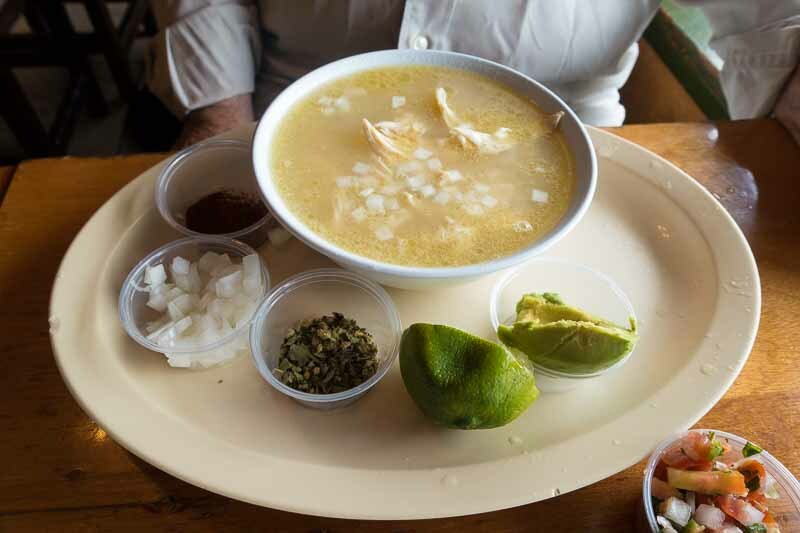 Gail loves pozole, a Mexican soup made with hominy, so that’s what she ordered. Soup and all the fixings. There was also a plate of fresh shredded cabbage to add, which Gail says is important. I had a fish taco, which turned out to be two of the tiny tortillas and some fish. There is a table with many different salsas and toppings you could add, but they were all way too spicy for my delicate sensibilities. Which is to say I’m a sissy when it comes to hot, and in a genuine Mexican joint everything is very, very hot. We also had a couple of enchiladas, one red and one green. They were smaller and simpler than the heavily cheesed and sauced version you get in more mainstream places, and we both enjoyed them. The tab for all of this was $21. This was an excellent, authentic Mexican meal, from what was at best the second best place on the street. I’ll keep looking to see if we can get into La Taqueria Super Rico without a line another day. Thanks Jamie. Taqueria La Colmena duly noted and on the agenda for next trip through Santa Barbara. That place looks good! And the pozole looks great! !